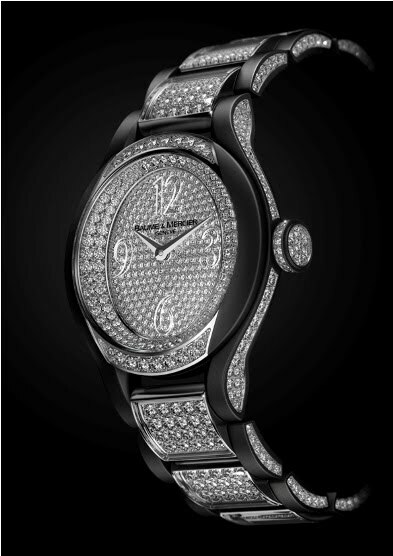 Over one thousand diamonds sparkling against a dusky background: Baume & Mercier sets the stage for absolute contrasts in its unique High Jewelry collection, clothing its ultra-feminine ilea model in a fascinating chiaroscuro effect. This unique model, issued in a strictly limited edition, mysteriously alternates between the intense matt blackness of a white gold frame coated with a PVD surface treatment, and the luminous sparkle of a full setting composed of 970 diamonds. This original and daring alliance between darkness and light accentuates Baume & Mercier’s undeniable creativity and expertise in designing ladies’ High Jewelry models. The stunningly beautiful iléa High Jewelry model is a vivid symbol of this proud heritage. It perpetuates the brand’s tradition of creating a limited-edition jewelry model every year by giving full creative rein to the talents of its Design Studio team. This year, Baume & Mercier designer Sabine Rochat has revisited the iléa model she created in 2008, while allowing her imagination to run wild. She has dared to use a matt black PVD coating on white gold as a perfect means of highlighting the thousand diamonds flowing like a river over the round, sensual shapes of the iléa model. The full-set, wider dial flange provides a broader perspective on the three-level dial: a transparent layer of sapphire bearing finely metallized Roman numerals and the Baume & Mercier brand name, is fitted between the gem-set dial base and the upper sapphire crystal. On the bracelet, a convex sapphire crystal also covers the gem-set inner links, thereby preserving both the glittering sparkle of the diamonds and the graceful curve of the band. For this exceptional creation, the watch diameter has been enlarged to 34 mm (compared with 30 mm for the classic iléa model) so as to accommodate a mechanical self-winding movement. The spectacular oscillating weight, appearing in the same matt black shade as the case and adorned with Côtes de Genève, may be admired through the sapphire crystal case back. Thus arrayed in its dazzling garment of light and shade, the unique iléa High Jewelry watch is a perfect illustration of the blend of technical and esthetic creativity characterizing Baume & Mercier watches since 1830.